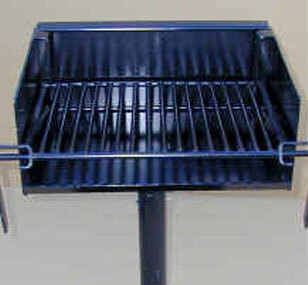 This stationary (in-ground mount) and surface mount grills (mounting plate included) are bound to please campers and picnic goers. They are designed and built for durability and functionality. From the 600 degree heat resistant painted finish to its adjustable cooking surface, it provides features that will be appreciated for years and years to come. Tip back cooking surface for easy loading of charcoal, and easy clean up. The firebox is attached to its' pipe stand, yet swivels 360 degrees for full accessibility. Handles swing down to prevent them from getting overly hot. 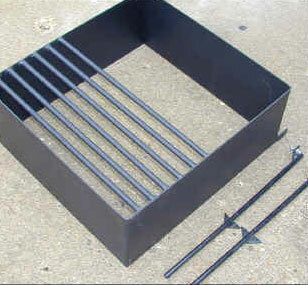 Sturdy 3/16" thick steel plate firebox, fully welded. Over all dimensions are 15" deep, 20" wide, and 8" high, providing ample cooking surface. Available in stationary mount or surface mount, so there is one that is right for you. 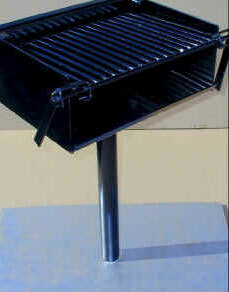 Order yours today and get ready for a great barbecue!